Welcome back to another week of Fantasy baseball. September call-ups have begun to arrive, so pay close attention to situations where you might be able to scoop up a valuable player for the final month of the season. This week, Cincy surprised a few people when it picked up Manager Bryan Price’s option for 2018 despite his ugly record in four years at the helm of the Reds; in other managerial news, Toronto’s John Gibbons was away Saturday dealing with a personal matter, and it’s reasonable to wonder if he’s nearing the end of his tenure; and Victor Martinez (heart) will need to undergo a procedure, ending his campaign. 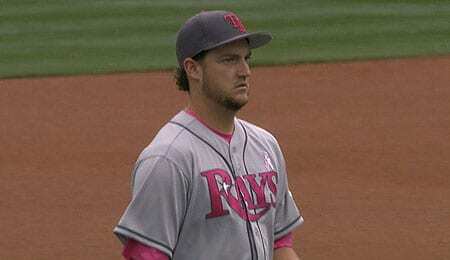 Matt Andriese, SP, Tampa Bay Rays (ESPN: 6.4 per cent; CBS: 23 per cent): Andriese took the bump Sunday to make his first start since June 10, and while it didn’t go very well, he’s someone you need to heed. He just returned last week from a hip injury, and looked very sharp, hurling three shutout frames while allowing just one hit. It’s been an injury ravaged season for Andriese, out in early June with a groin woe as well, but when he has pitched, he’s looked very good. His hit rates were at a career low, although homers were an issue. Still, Andriese’s K rate has risen every season, and if he can avoid the DL, he can be a very serviceable starter. And he’s not afraid to pitch inside (see video below). Eduardo Escobar, 3B, Minnesota Twins (ESPN: 5.6 per cent; CBS: 13 per cent): Miguel Sano (shin) should be out at least another week, allowing Escobar to continue to man the hot corner for the Twinkies. All Escobar did Saturday was pound two dingers and drive in six runs — not bad for a little (5’10, 185) guy! Escobar looked awful last season, but has rebounded nicely in 2017, proving he’s a useful utility player that can offer some value when he steps in as an injury replacement. He’s morphed into an extreme flyball hitter and that’s paid off in a career high 14 jacks. Burch Smith, SP, Tampa Bay Rays (ESPN: unowned; CBS: unowned): Yes, another Rays’ starter looms on the horizon in the form of former Padre Smith. He underwent Tommy John surgery in April 2015, and is still on the comeback trail, but his recent results suggest he’s ready for another crack at the Show. Smith hurled 5 2/3 shutout innings on Friday to earn the win at Triple-A, and he’s been lights out in three starts at Durham. He’s proven he can win in the minors again; now let’s see what he can do in the majors. D.J. Stewart, OF, Baltimore Orioles (ESPN: unowned; CBS: 1 per cent): The Orioles’ first round pick from 2015 is enjoying a breakout campaign at Double-A, punctuated by a huge two-homer, six-RBI night last month. Stewart is red hot right now, as the team’s No. 18 prospect went 2-for-5 with two dingers (his second multi-dinger game of the year) on Saturday and is now batting .368 over the last 10 games. He’s set career highs pretty much across the board this season, piling up tons of runs and total bases while hitting the ball on the ground less often, leading to way more homers. Blake Parker, RP, Los Angeles Angels (ESPN: 20.4 per cent; CBS: 25 per cent): After Bud Norris faltered as the closer in Disneyland, Parker took over amidst a very muddy situation. Since August 26, Parker has gone 4-for-4 in save chances with but a single walk as the only flaw in those appearances. He’s enjoying a career year at age 32, and if you’re seeking saves to put you over the top, this is your man. Jacoby Ellsbury, OF, New York Yankees (ESPN: 17.1 per cent; CBS: 24 per cent): With Aaron Hicks (oblique) landing on the DL, Ellsbury should get a chance to play more down the stretch. Injuries and ineffectiveness have massively cut into Ellsbury’s plate appearances this season, but perhaps he can step up when you need him most. His counting cat numbers are obviously way down, but a significantly low BABIP (for him) could also be behind some of his struggles. It’s a couple of years now since Ellsbury was an above average player; perhaps September will offer him a chance at some redemption. Josh Tomlin, SP, Cleveland Indians (ESPN: 11.4 per cent; CBS: 20 per cent): After missing all of August because of a hamstring injury, Tomlin is back, starting on Sunday. He’s capable of racking up some quality innings for your Fantasy team if you need pitching help. Jose Martinez, OF, St. Louis Cardinals (ESPN: 1.2 per cent; CBS: 3 per cent): Obviously the numbers Martinez put up in his cup of coffee last year were unsustainable, but this dude knows how to get on base, making him an interesting option in very deep NL-only leagues. Alex Mejia, IF, St. Louis Cardinals (ESPN: unowned; CBS: unowned): Mejia didn’t do much in his first time up with the Cards, but he’s back as a September callup and is getting the start at third base on Sunday. He cut down on his infield fly rate this year at Triple-A, leading to an impressive .335 BA. Harrison Bader, OF, St. Louis Cardinals (ESPN: 0.6 per cent; CBS: 5 per cent): Another Cardinal callup, Bader has been automatic 20-20 man throughout his minor league career and deserves to be stashed in dynasty formats. Jason Castro, C, Minnesota Twins (ESPN: 2.4 per cent; CBS: 11 per cent): Desperate for catching help in a deep or two-catcher league? Try Castro, who has been activated after being cleared to play after his concussion. He’s actually been a bit better this year and is just one run shy of tying his total from all of 2016. When he eventually completes his climb to the top, he will be a huge star of the game, one who fans will love to watch and Fantasy owners will wish they had on their team. Three years ago, Alvarez was just 24 and in the midst of a breakout season in which he recorded a 2.65 ERA en route to earning Cy Young consideration. The following year, he made just four starts and shoulder woes have kept him sidelined since. Well, he’s healthy now, putting on a showcase for MLB teams this weekend as he aims to get a chance to make a comeback. Given his still tender age, pedigree and tremendous control, Alvarez is worth tracking as we see how this plays out. Who knows? This Venezuelan could be a surprise source of value in the second half given how many teams need pitching help.